Ben Wheatley’s A Field in England will be the first ever film to be released in UK nationwide cinemas, on free TV, on DVD and on Video-on-Demand on the same day – with Film4, Picturehouse Entertainment, 4DVD and Film4 Channel partnering for nationwide multi-platform distribution on Friday 5th July. The film is one of the first to receive funding from the BFI Distribution Fund New Models strand, which supports experimental and ambitious release models. The unique release will give audiences and fans of Wheatley’s previous films (Down Terrace, Kill List, Sightseers) the choice of how and where to experience his new film – a psychedelic trip into magic and madness – whether it’s amidst an audience in the cinema, followed by a satellite Q&A with Ben and the cast; delving into multiple extras on a special edition DVD; from the comfort of the sofa showcased with a director’s intro and interview on TV; or the freedom to watch when they want on VoD. The more intrepid audiences can also follow in the footsteps of the film’s characters, with screenings planned in a field (or few) in England across the summer. "It's great to team up with Film4 to make this film and to work with new partners such as Picturehouse and 4DVD. We have tried to innovate with this film, in production and distribution. I'm very proud of the results and look forward to sharing the film with the audience." "From the word go, A Field in England was a hugely original idea – you'd expect no less from Ben and Amy – so we wanted to build the project with the team in a way that was true to that. The film is a really exciting next step in the progression of Ben's work as a director and will be something the likes of which a whole generation of audiences won't have ever seen. I'm incredibly pleased we've formed this innovative partnership to take this brilliant film out to them in a truly ground-breaking way." "Ben is undoubtedly one of our boldest, brightest and most audience savvy filmmakers and so it made complete sense to look to develop a project with him that would lend itself to this kind of daring and innovative release. We’re lucky to have found in Picturehouse Entertainment, 4DVD, the Film4 channel and BFI partners who share our vision to disrupt the status quo and experiment with new distribution patterns, to create this exciting event style release." "We're proud to have an intimate understanding of our audience, as are Film4, which is what makes this collaboration so exciting. Our eagerness to explore and experiment with new platforms of distribution in an evolving film landscape makes us all the more thrilled to be able to get this innovative film out there to the audience it so readily deserves. Ben Wheatley is a genuinely unique British talent and we could not be happier to be working with him on this film." 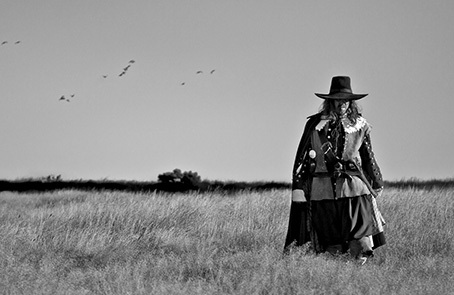 A Field in England takes place during the English Civil War. A small group of deserters flee from a raging battle through an overgrown field. They are captured by two men: O'Neil and Cutler. O'Neil (Michael Smiley), an alchemist, forces the group to aid him in his search to find a hidden treasure that he believes is buried in the field. Crossing a vast mushroom circle, which provides their first meal, the group quickly descend into a chaos of arguments, fighting and paranoia, and, as it becomes clear that the treasure might be something other than gold, they slowly become victim to the terrifying energies trapped inside the field.